Baz Bus Timetable ??? how it works? These are the scheduled departure days for each city along the route. For example, if you are in any city between Cape Town and Port Elizabeth and you want to travel with Baz Bus to another city, the bus departs Cape Town on these days: Monday, Tuesday, Thursday, Friday and Saturday. – Shuttle notes (if applicable). Now you have to check what time the bus will pick you up from your hostel in Cape Town and drop you off at the hostel in Swellendam. 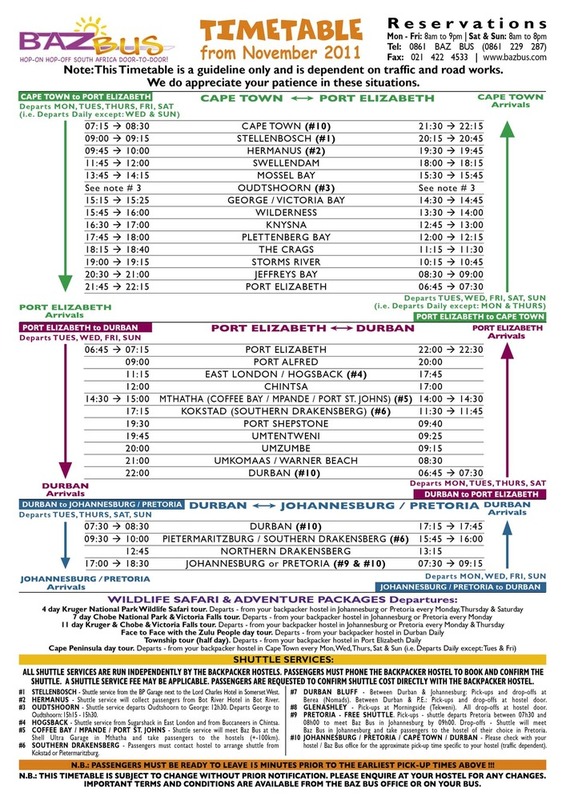 You will see listed the pick up time for Cape Town is 07:15 –> 8:30am. This means that Baz Bus will pick up passengers (including you) from all hostels in Cape Town between these times. There is also a specific hostel pick up time so please confirm the time with your hostel or the Baz Bus office. Now you want to know what time we will arrive in Swellendam. You will see listed the drop off time for Swellendam is 11:45 –> 12.00pm. All pick up and drop off times are the same for each city along the route. So you were dropped off in Swellendam at 11:45 –> 12.00pm so when Baz Bus picks you up again it will be the same time 11:45 –> 12.00pm. Also, remember that you must be ready to leave at least 15 minutes prior to all scheduled departure times. As our buses do not travel throughout the night we have 2 compulsory overnight stopovers which are Port Elizabeth and Durban. To reach out of the way places or remote areas such as the Wild Coast etc, shuttle services are operated by the hostels in these remote areas. There are extra charges for these. Please contact the hostel of your choice for further details and to book your shuttle in these areas. For example if you choose to go to Coffee Bay please refer to the section: Shuttle Services and then refer to the applicable shuttle note i.e. : Mthatha (Coffee Bay/ Mpande/ Port St Johns) #5 for details. Sneek Preview of our buses – Your Seat! Your Space! Your Ride! I saw a Bazbus at Storms recently and thought you are just what I need. I am an ancient backpacker but I am wanting to get from Port Elizabeth to Durban (actually Mooi River) between 23 July and 15th August. The August being from there back to PE. Do you still do that trip. Please let me know. I would drive but my darlings think I am too old!! I could fly but the price is ridiculous. R3000.00 odd return! !’ My daughter is at Trevorton College in Mooi River and you could drop me anywhere in the vicinity or take me to Durban and they will fetch me.